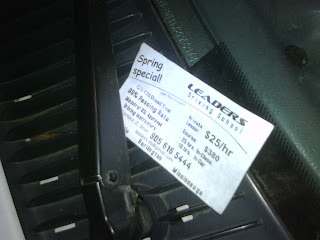 lissa and i were leaving the mall one day and i noticed some junk mail underneath the windshield wiper on my car. i picked it up and it was a card advertising for a driving school. if i found it under the windshield wiper of MY car, shouldn't i ALREADY KNOW HOW TO DRIVE? i know there are some idiots on the road, but this seems pointless.